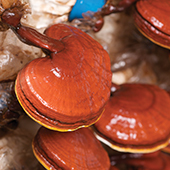 Ganoderma lucidum (red mushroom) is a type of mushroom which had been used as traditional Chinese medicine since thousands of years ago. The herbal history of Ganoderma lucidum had long been documented in the oldest Chinese pharmacopeia, “Sheng Nong’s Herbal Classic”. 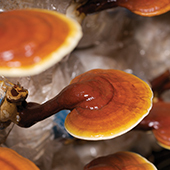 Ganoderma lucidum was seen as a symbol of prosperity and peace for the nation and longevity for the emperor. Ganoderma lucidum has different names in various countries. 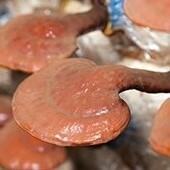 For example, Ganoderma is known as “Reishi” in Japan, “Lingzhi” in China and “Youngzhi” in Korea. Ganoderma lucidum is a member of the fungus family that naturally grows on fallen trees and logs of other broad leaf trees. It is made up of the mycelium and fruiting body. 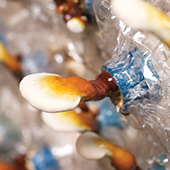 Mycelium is the basilar and white villiform that supply needed nutrients for growth, while the fruiting body appears in umbrella form including the germ handle and the germ umbrella. Both the mycelium and fruiting body are edible and have various medicinal properties that can be used to prevent and ameliorate human diseases.